If true tales of pirates and stories of early settlers intrigue you, then come walk the streets of Beaufort, NC, many of which are over three hundred years old. Beaufort-by-the-Sea, as many call this fish town, has historical charm and present-day vitality. 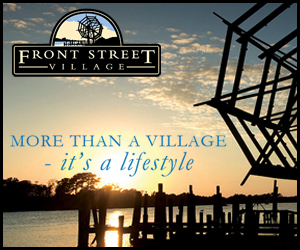 Whether you fly into the small airport in Beaufort or drive in on the Highway 70 bridge, you’ll find one of America’s coolest small towns. The tree-lined streets (centuries-old live oaks you could not wrap your arms all the way around even if you wanted to), restored Victorian homes, and picturesque boats in the harbor are just a few reasons why locals and tourists love Beaufort. Delve into Beaufort’s history with your first stop at the Welcome Center of the Beaufort Historic Site which includes nine historic buildings, two acres, and more captivating history and entertainment that you can absorb in one day. Be sure to bring your little ones to walk in the small hedge maze on the grounds. If you are there on the weekend, don’t be surprised if you catch a glimpse of a bride and groom taking their vows in this idyllic setting. If you’re shopping for art or just appreciate viewing exceptional handiwork in all mediums, drop by the lovely Mattie King Art Gallery housed in the two-story white clapboard Rustell House circa 1732 beside the Welcome Center. Inside you’ll find juried art from featured local artists and, if you listen carefully, you’ll hear the rhythm of weavers on their looms upstairs. For a full tour of Beaufort’s history, hop on the Historic Site’s double-decker bus, see, and hear about the area’s various historic homes. Be sure to take the guided tour of the Old Burying Grounds where both Confederate and Union Soldiers were buried, as well as, entire families who died of yellow fever, and a young girl in a rum barrel who died at sea but was brought home to Beaufort for burial. For more details about the famous pirate, Blackbeard, stroll to the North Carolina Maritime Museum to see artifacts from his ship, Queen Anne’s Revenge, which ran aground near Beaufort in 1718. Besides the outstanding museum displays, you won’t want to miss the events downtown in May which surround the Annual Wooden Boat Show. In this quaint town steeped in history, there’s plenty of wine-sipping and toe-tapping to fill up the present. Every year in April the Beaufort Wine and Food Weekend brings together wine-makers, distributors, winery owners, and pairs them with local and celebrity chefs. Visit Beaufort in May for the Beaufort-by-the-Sea Music Festival which fills Front Street and Taylor Creek with lively music. For those who just can’t sit still there’s the Beaufort Road Race, and for those who want to join the Beaufort Sister Cities Mural Competition takes place the same weekend. An annual spring event which is rooted in the history of the area is Loon Day, a loon decoy competition hosted by the Core Sound Decoy Carvers Guild in Harkers Island. Traveling highway 70 in a horseshoe route from Beaufort, you arrive in Harkers Island, a small maritime community accessible by bridge. Harkers Island is directly across from Shackleford Banks, which is inhabited only by wild ponies and other wildlife. The Loon Day competition brings folks from all around for judging of the decoys as the handmade model birds sit in the water. Spectators watch from the bridge and the whole day is filled with family-friendly events, food, and fund-raising for the local community. In the history of Harkers Island, the residents shot loon as a way of surviving on the land, but that is not the case anymore. Beaufort (pronounced BO-fort), North Carolina, is the county seat of Carteret county and is not to be confused with Beaufort (pronounced BU-fort), South Carolina. Beaufort looks across Taylor Creek and Bogue Inlet to an extraordinary island known as Shackleford Banks, home of wild ponies. The ponies are a part of the rich history of the area. Folks living on the Outer Banks decades ago began referring to the small horses that live and breed on the island as the Banker ponies. Researchers believe the ancestors of this equine community arrived on Spanish ships over four hundred years ago. Tour boats take visitors to view the horses in their natural environment, and the Wild Horses of Shackleford Island Foundation oversees and protects the ponies. This nine-mile island is perpendicular to the longer strip of the island known as Cape Lookout National Seashore where Cape Lookout Lighthouse is located.